Register a new account for each wristband if you want to keep your spending separate. Assign a wristband to each of your buddies and have them each create a new account with their wristband numbers. 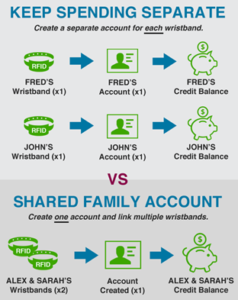 If you add two or more wristbands into the same account, this is called a “Shared Family Account“, and all linked wristbands will be able to make purchases using the same pool of funds. You will NOT be able to separate spending amounts.